My first ever win on any cardmaking challenge blog! I am grinning from ear to ear. Wohoo! 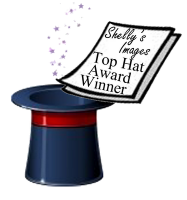 I won top hat award at Shelly's images. I am going to dance all day today. congrats, very happy for you !! !